In which I follow up on the results of my previous recommendations. So how did that turn out? Today I ran the same course at about the same time of day. The weather was a little nicer, but I kept in mind that my prior conclusion was to attempt to run the first couple of miles a little faster, and to push the final mile. Obviously, I pushed the first mile way too hard. This is obvious simply because it's almost 40 seconds per mile faster than during my previous workout. That certainly isn't what I intended! Probing the mile splits a little more deeply, though, we can see that I struggled to maintain that pace for the rest of the run, proving for certain that I started out way too fast. On the other hand, judging by my average heart rate, I didn't actually over-shoot too badly. Miles 2 through 4 came in at roughly the same average heart rate as Tuesday, despite my having run those miles twenty seconds per mile faster. The Band 2 estimates that I only burned 5 additional kCalories today versus Tuesday. 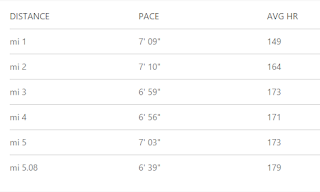 Tuesday's run was pretty good in that my pace didn't vary too much. I started out at about seven minutes per mile and basically held that all the way through. 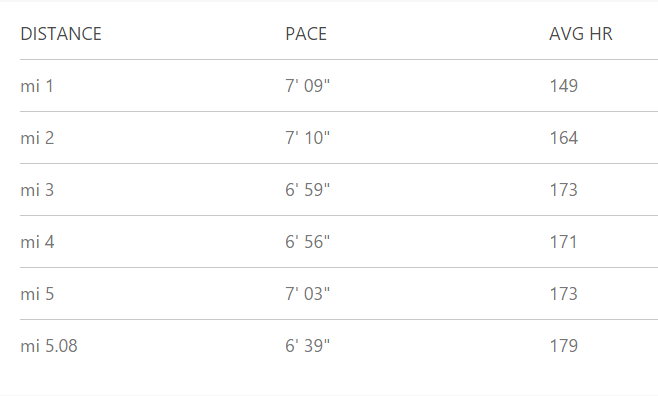 Today my pace steadily decreased until the final mile, when I reminded myself to try a little harder not to lose pace, and I ended up with a negative split. As far as future recommendations go, I have a few of options. One would be to attempt to repeat today's run next time, only concentrating on maintaining a constant, 6:30/mile pace. This isn't a terrible idea, but a more practical way to accomplish the same goal would be to add one day a week of interval training to decrease my pace, and use the other days to train for pace maintenance. At 25-30 miles per week, though, I don't think there's any point. I'm not training for a race and I don't have much of an endurance base built up, so... why? Another option would be to choose a slightly slower pace, something between 7:00 and 6:30 per mile. Probably, I would choose something like 6:40/mile, since that is slightly faster than my slowest mile. That's fast enough to challenge my leg muscles, but won't raise my heart rate much - in fact, if anything, it will lower it slightly. I actually like this option, and I may very well just mentally "accept" 6:40/mile as my target pace, since it doesn't appear to push my cardiovascular system any harder than running at a much slower pace. 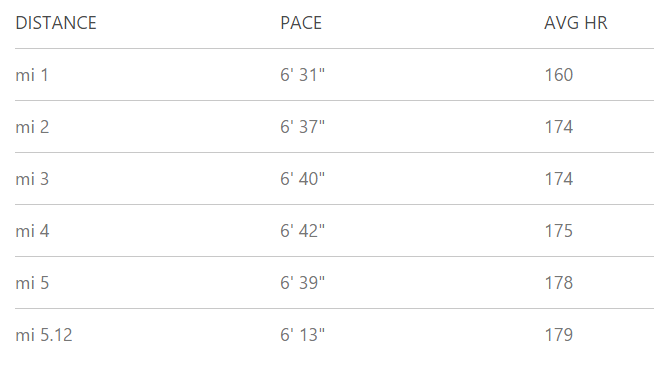 Given that a large improvement in running pace has produced a negligible change in both calorie consumption and heart rate, my guess is that best way to improve my fitness going forward is not by running faster, but by running further. Once acclimated to higher mileage, I should then work toward adding an interval training day or two in order to increase my aerobic threshold and, hopefully, reduce my overall heart rate. The popular wisdom out there suggests that people don't need to do a lot of cardio, they just need to do a couple of sessions a week at a higher intensity. What this data seems to suggest is the opposite: do more minutes and, as long as you're maintaining an elevated heart rate, you will burn more calories. This certainly has weight loss implications. Of course, I have yet to test out an interval workout, and eventually I absolutely must. But there is at least a prima facie argument that more cardio minutes = more calories burned. If I am missing something obvious, please kindly correct me in the comments section. Naturally, I will follow this matter closely as I continue to make use of my fitness tracker. It looks like I need to increase my weekly mileage. This, however, is not a purely cardiovascular question. I can't put my heart through more mileage if my muscles and joints can't handle the additional effort. So that means I should finish out my plan for the week (five miles per day) and attempt to increase to six next week. I will not worry too much about my pace. 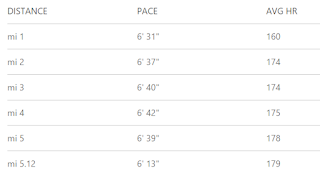 I think 6:40/mile is a reasonable target, but I'm not going to attempt to decrease my pace any further than that. Obviously, though, running much slower than 7:00/mile is kind of pointless. I'd merely be getting a lower-quality cardiovascular workout with no real benefit (and potentially at the expense of good running form). There it is. As usual, I'll let you know how it goes.